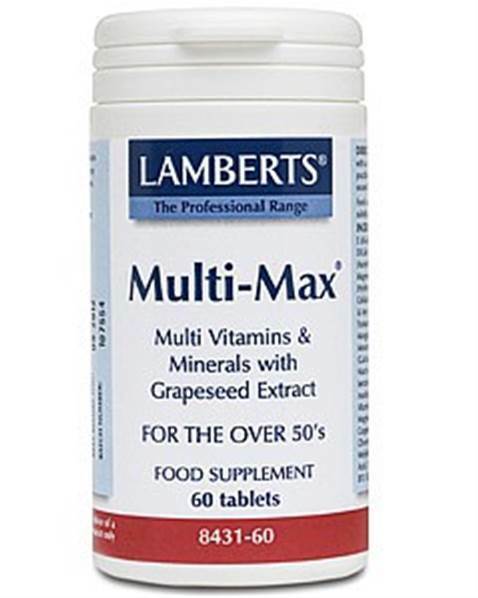 Lamberts Multi-Max, A multivitamin and mineral health supplement for the over 50s, ideally suited for periods of recovery and for suppressed appetite and low energy levels. This is the original Multi-Max® formula, a high potency one-a-day multi ideally suited for the over 50’s. Recent UK dietary surveys have revealed that a significant proportion of the over 50’s do not achieve the RNIs for some micro-nutrients. Of particular concern among this age group are Vitamin D and the trace elements zinc, iron and selenium. Multi-Max® Advance is a similar product to this one, but has the additional benefits of plant based antioxidants, plus lutein. However, the B vitamins in this original Multi-Max® formula are higher than in Multi-Max® Advance, which makes it a good choice for patients that need to quickly correct any B vitamin shortfalls. Multi-Max® can in fact be used instead of a B complex. Both these multi formulas provide a very comprehensive spread of essential trace minerals which are included at potencies that will support even the worst diet. Multi-Max® was one of the first multis to provide a full 200mcg of selenium and 200mcg of chromium. Multi-Max® can be taken with Osteoguard® if additional calcium and magnesium are required. Alternatively our new 3-a-day MultiGuard® Osteo Advance 50+ provides a similar spread of micro nutrients plus an impressive level of calcium and magnesium. Cellulose DiCalcium Phosphate Tablet Coating (Hydroxypropyl Methylcellulose Cellulose Colour: Titanium Dioxide & Iron Oxide Glycerin) Stearic Acid Silicon Dioxide Magnesium Stearate. Suitable for vegetarians.A brown coated oval tablet.